Whether you’re looking for oil filters, air filters, fuel filters, or – more likely – all of the above, we have Yanmar filters for a wide range of machines and applications. Maintaining clean, fresh filters for your equipment is an often untapped opportunity to improve efficiency and save operating costs with your Yanmar equipment. Your Yanmar engine is at the heart of your equipment’s health and it’s critical to find high-quality, reliable engine parts when they need to be replaced. With Dominion Equipment Parts, you can feel confident getting even the most integral parts for your Yanmar engines. Yanmar’s hydraulics are among the most powerful and responsive in the construction industry, but if your parts are old and worn then you’ll lose out on a great deal of the power and efficiency potential of your equipment. If you want to keep your equipment in great shape, reduce the amount of wear and tear on specific parts and get more mileage out of our equipment, Yanmar parts are a great way to achieve all of those goals. Whether you’re looking for undercarriage parts to repair your Yanmar machine or you are simply maintaining and updating your equipment, you can trust Dominion Equipment Parts to provide OEM replacement parts that will get the job done. Even smaller Yanmar parts, such as a wide range of hoses and belts, are available from Dominion Equipment Parts. Call us today at 1-866-366-0225 to get more details about the hoses and belts needed for your Yanmar equipment. Buy with confidence: Manuals for all Yanmar parts are available so there’s no guesswork with installation or use. Call our knowledgeable sales people at 1-866-366-0225 and you could have your new Yanmar OEM part by tomorrow! Since 1998 Dominion Equipment Parts has provided OEM Yanmar parts to the US market. All Yanmar Construction Equipment models are supported with the correct OEM parts to keep your equipment running like new. Yanmar Co., Ltd. is a Japanese manufacturing company that makes a wide range of diesel engines, construction machines, light-weight equipment and more. 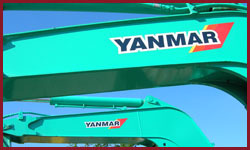 Founded over 100 years ago, the Yanmar brand is highly trusted and respected in the construction industry.